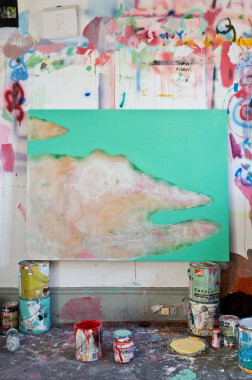 From 5 – 29 April 2012, Matlok Griffiths will exhibit a selection of new works at Chapter House Lane. Join us for the opening from 6-8pm, Thursday 5 April. After a recent holiday in South East Asia, the Melbourne painter shifted from his previously primary palette to the pastels and hues reminiscent of the fine light, French shutters and Áo Dài traditional dress of Vietnam and Laos. Incorporating obscure, layered objects, his newest body of work also features iconic emblems of the region like the Lacoste/’low-cost’ crocodile, the banana, and the outdoor ‘free-air’ barber shop. Griffiths’ clean finishes belie the previous incarnation of the canvas. And as an artist who pays great weight to the evolution of the work, he points to the colourful bleed, reminding us there’s much more than a formulaic holiday-home furnishing in play. Having previously exhibited in Sydney, Brisbane, Melbourne and Auckland, Griffiths’ impressive show is a must-see. To view the price list for “Chic & Contemporary Holiday paintings” please click here. Alternatively, take a look at Matlok’s website and/or Curriculum Vitae.